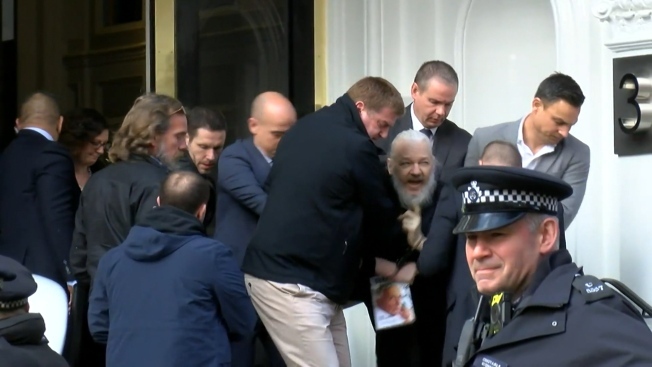 Julian Assange's arrest on Thursday in the Ecuadorian Embassy in London opens the next chapter in the saga of the WikiLeaks founder: an expected extradition fight over a pending criminal prosecution in the United States. It's also likely to trigger a debate over press freedom and call attention to unresolved questions about Assange's role in the release of stolen Democratic emails leading up to the 2016 presidential election, part of special counsel Robert Mueller's recently concluded investigation into ties between the Trump campaign and Russia. He's accused of conspiring in 2010 with Chelsea Manning, then a U.S. Army intelligence analyst who leaked troves of classified material to WikiLeaks, to crack a password that would give her higher-level access to classified computer networks. Prosecutors say Assange and Manning tried to conceal Manning's role as a source by deleting chat logs and removing usernames from sensitive records that were shared. They used a special folder to transmit classified and national defense information, the indictment says. Assange ultimately requested more information related to the password, telling Manning that while he had tried to crack it, he "had no luck so far." Assange and his supporters say he's a journalist who deserves legal protections for publishing stolen material. But the indictment doesn't really have to do with whether Assange is a journalist. The allegations don't relate to the publication of classified information but focus on his attempts to obtain the material in what prosecutors say was an illegal manner. That distinction could be vital in the government's case and complicates Assange's efforts to cast the prosecution as infringing on press freedom. Justice Department media guidelines are meant to protect journalists from prosecution for doing their jobs, which has historically included the publication of classified information. But the protections don't easily extend to journalists or others who themselves break the law to obtain information or who solicit others to do so, as the government alleges. "The act of coaching" someone how to steal information, as alleged in the indictment, "is a step too far," said Ryan Fayhee, a former Justice Department prosecutor who specialized in counterintelligence cases. But his publication of stolen Democratic emails during the 2016 campaign and reliance for them on a foreign adversary like Russia may undermine any defense claim that he's motivated by a public good. "His conduct, and his organization's conduct, I believe, undermines any defense that he would pursue having to do with his genuine interest in rooting out corruption and his absolute commitment to transparency," Fayhee said. "Because Russia is anything but the right model to point to in terms of transparency." Justice Department officials could easily supplement their indictment with a new one with more serious charges. Manning was jailed last month after she refused to testify before a grand jury in Virginia, suggesting that prosecutors' work related to Assange is not done. However, hitting Assange with a superseding indictment would be a violation of the doctrine of specialty, a principal of international law that prohibits a requesting state from charging a person for offenses that are not included in the extradition order. 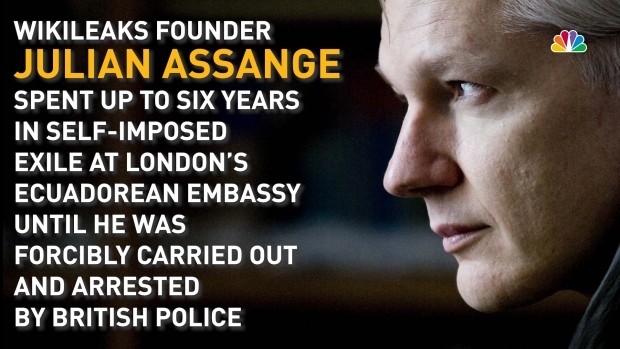 That means, unless the additional charges are included in the extradition order that the UK agrees to, Assange can only face trial for offenses presented to justify that extradition. Ecuador's president, Lenin Moreno, said he had secured a guarantee from the United Kingdom that Assange wouldn't be extradited to a country where he could face a death penalty. That's likely a reassurance to Assange's supporters, but the charge he currently faces carries just a five-year maximum penalty. Though some of the language in the indictment, including the references to national defense information, mimics the Espionage Act, there's no allegation Assange disclosed American secrets to a foreign power with the goal of harming the U.S.
On its face, the charges have nothing to do with Mueller's probe. The indictment was brought not by Mueller and his team but rather by prosecutors in Virginia and the Justice Department's national security division. That's striking since Assange and WikiLeaks have surfaced, albeit obliquely and not by name, in multiple criminal cases brought by Mueller. WikiLeaks was the organization that published Democratic emails stolen by Russian intelligence officers. And Roger Stone, a Trump confidant under indictment, repeatedly boasted of connections to WikiLeaks and of having advance knowledge of the organization's publication plans. That could suggest Mueller didn't see a criminal case to be made against Assange or deferred to the Justice Department's existing investigation into him.